A simple meal that showcases the gorgeous flavors of summer. 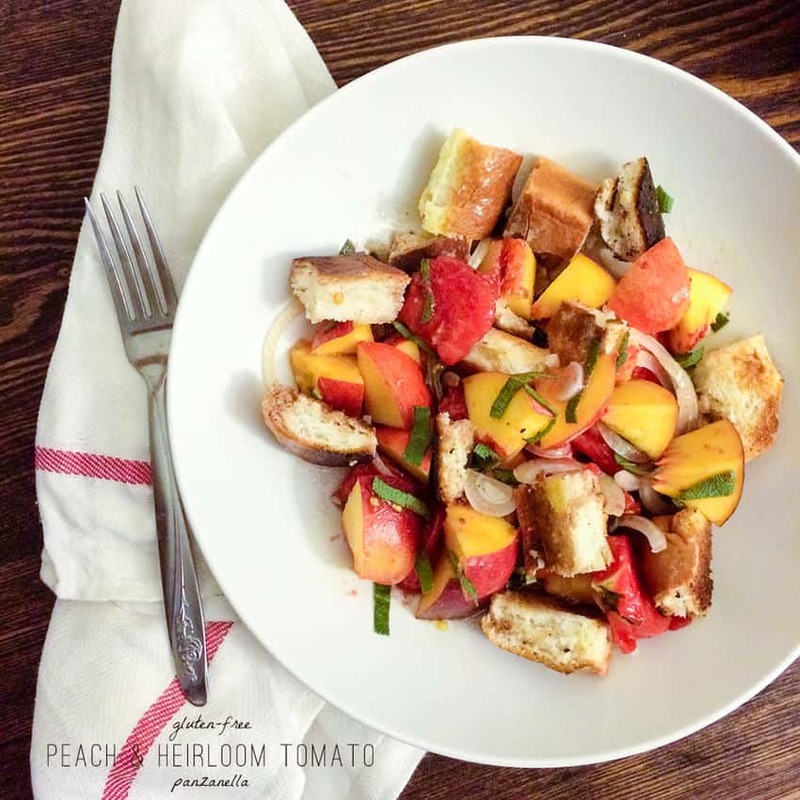 Gluten-Free Panzanella with Peaches, Heirloom Tomatoes and Sage – one of our favorite summertime recipes! This easy, seasonal recipe can be simply multiplied by the number of servings you need. It certainly tastes like summer, and the farmer’s market does not disappoint. Particularly the Green City Market (Chicago’s largest farmer’s market which I had been wanting to hit up ever since I moved in). It was everything I had been hoping for. And more. There was local honey and preserves and a honey mint soda. Heirloom tomatoes in more varieties than I could count. 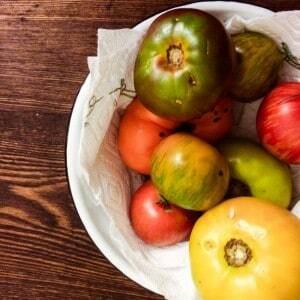 It was as if all the best parts of summer produce converged in one place. And I didn’t want to leave. The only downside to the market is the bus ride home. The bus ride where a peach and a tomato are damaged despite your efforts to be careful. So what do you do? You make them in to something. And a gluten-free panzanella sounds like what the doctor ordered. You open your freezer and discover all you have are the hot dog buns you bought for a memorial day cookout (and now it is labor day and you still haven’t had grilled brats). It’s ok. This panzanella doesn’t judge your bread. The whole point of the bread is to soak up all those lovely juices from your produce. Good quality olive oil and balsamic vinegar with some fresh from the garden sage, a few thin slices of onion, salt and pepper round out this lovely lunch. You can even make this with undamaged fruits (you careful shopper, you!). If you need to feed more than one, simply multiply the recipe by the number of people you want to serve. This Gluten-Free Panzanella with Peaches, Heirloom Tomatoes and Sage comes together easily and celebrates late-summer produce. It can be easily multiplied for more than one and works as a great way to use up lonely slices of bread (particularly the ends no one likes or hot dog buns that happen to be hanging out in your freezer). Don’t use dried sage in place of the fresh. If you don’t have sage, fresh mint or basil could also taste quite good here. This gluten-free panzanella salad from Mary Fran Wiley comes together easily and celebrates late-summer produce. It can be easily multiplied for more than one and works as a great way to use up lonely slices of bread! Dice your tomato and peach. Slice your onion as thinly as you can (if you are not so good at slicing, use a mandolin). Chiffonade or tear your sage leaves. Dice or tear your toasted bread. Toss all your prepared ingredients in a bowl with the salt and drizzle with the olive oil and balsamic. This entry was posted in I Say Tomato, Main Dishes, Recipes, Recipes & Techniques by Cooks We Love, Salads & Dressings, Side Dishes and tagged autoimmune disease, celiac, celiac disease, celiac health, food allergies, g-free diet, G-Free Foodie, gluten, gluten allergy, gluten free, gluten free bourbon, gluten free cooking, gluten free diet, gluten free dining, gluten free food, gluten free health, gluten free whiskey. Bookmark the permalink.